The NSWCA’s Continuing Education Series recently featured guest speaker Robert J. Freeman, Esq., Executive Director and Chief Attorney of the New York State Committee on Open Government. Mr. Freeman’s informative and entertaining presentation centered on the Freedom of Information Law (FOIL), including compliance, public access and best practices. He addressed the group on details of public access, the scope of freedom of information, and lesser known or often-misinterpreted facts of open meeting compliance. All observations were explained to assist elected officials in maintaining best practices when serving their municipalities. The training meeting was open to all NSWCA members and district employees and was extremely well attended. 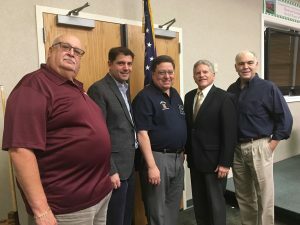 Left to right: Hicksville Water Commissioner and NSWCA Secretary Bill Schuckmann; Oyster Bay Water District Commissioner and NSWCA 2nd VP Michael F. Rich III; NSWCA President and Plainview Water District Commissioner Andrew N. Bader; Mr. Freeman; West Hempstead Water District Commissioner and NSWCA Treasurer, Kenneth P. Wenthen Jr.